Celebrate with a diamond eternity ring. 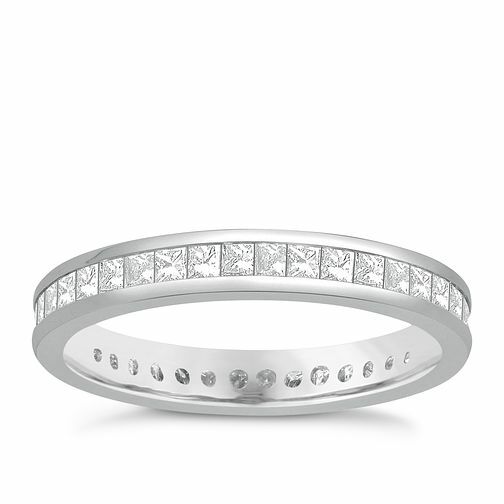 Platinum one carat princess cut diamond full eternity ring is rated 5.0 out of 5 by 2. Rated 5 out of 5 by Anonymous from My Perfect Eternity Ring I absolutely adore this ring, bought as a Christmas present by my husband. When we went to choose & order it, as its specially made, the expected delivery date was after Christmas, so I am utterly thrilled it arrived today 21/12/17. Can't wait to wear it on Christmas Day!! Thank you Ernest Jones. Rated 5 out of 5 by Anonymous from Beautiful An absolutely beautiful ring. Purchased as a gift and a surprise for my wife, the look on her face when she opened the box was worth every penny spent.